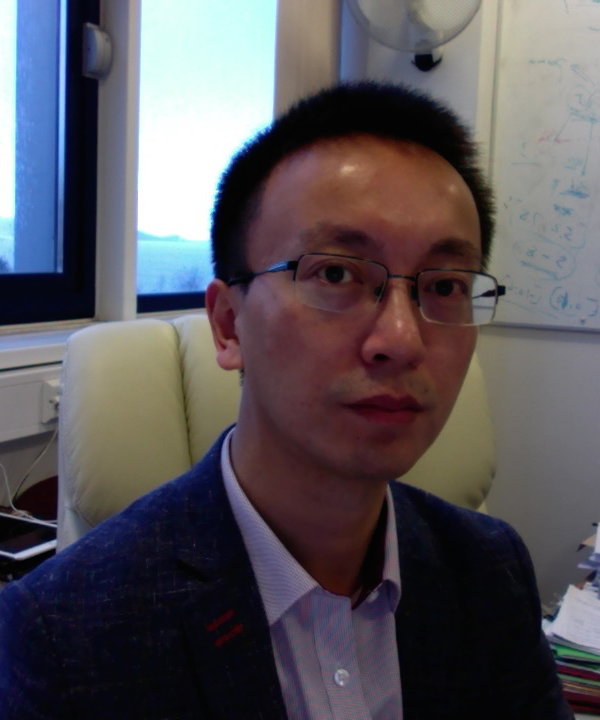 I am currently a Professor in the Visual Computing Group at the Department of Computer Science, University of Swansea. I was holding an RCUK Academic Fellowship between September 2009 and March 2012, a Senior Lecturer between October 2012 and March 2013, and Associate Professor till February 2019. Prior to my position at Swansea, I was a Research Associate in the Computer Vision Group, Department of Computer Science, University of Bristol, working on a European Commission project, CASBliP. I received my M.Sc. degree (with commendation) in Advanced Computing in 2002 from the University of Bristol, UK. Then, I continued to pursue a Ph.D. degree in the same department from the end of 2002, under the supervision of Prof. Majid Mirmehdi. Prof. Barry Thomas was also involved in cosupervision at the earlier stage. I finished my Ph.D. study in March 2006. I have strong research interests in video analysis, stereo systems, active contour models, level set methods, texture analysis, and medical image understanding. Click here for an up-to-date information on research projects. You may call me Jason, if you struggle to pronounce a name beginning with "X" (I have two!). My surname is pronounced probably similar to "Shay". Please visit the Publication page on the SwanseaVision website. PARSER: Parking and AiR pollution SEnsoRs for Smart Cities, funded by InnovateUK, £319,514.40, Co-PI, 01/03/2019 – 28/02/2021. Fraud Detection in Dual use of Goods using Explainable Machine Learning and Visual Analytics, funded by InnovateUK, £172,139.08. PI, 01/09/2018 - 30/11/2019. Predictive Big Data Analytics for Human Health and Animal Wellbeing, SÊR CYMRU Cofund, £63,082.35, PI, 01/07/2018 - 30/06/2020. Data Release - Trust, Identity, Privacy and Security, Co-investigator, led by Prof. Mark Jones (Swansea), funded by EPSRC (EP/N028139/1 and EP/N027825/1), £1.6M, June 2016 - 30 November 2019. Biomedical Research Unit: Advanced Medical Image Analysis and Visualisation, Collaborator, led by Prof. John (Bangor University), funded by NISCHR, £312K to Swansea (£1.5M in total), 2011 - 2015. Non-Invasive Quantification of Complex Heart Valve Lesions: A model-based approach using 3D echocardiography, Co-investigator, led by Dr. van Lool(Swansea University), funded by NISCHR, £58K, 2011 - 2014. Patient Specific Multi-view Coronary Geometry and Computational Disease Modelling, Principal investigator, funded by WORD, £144K, 2010 - 2012. NISCHR Registered Research Group: Medical Image Analysis and Visualisation, Co-investigator, led by Prof. Zwiggelaar (Aber University), funded by NISCHR, £95K, 2010 - 2013. Wales Research Institute on Visual Computing (RIVIC), I am leading a sub-programme on 3D Vision and Medical Image Analysis. RIVIC attracts £5M funding from WAG, 2009-2013. PRINS: Prior-independent Shape Regularisation for Geometric Active Contours, Co-investigator, led by Prof. Mirmehdi ( Bristol University), funded by The Leverhulme Trust, £65K, 2006 - 2008. Here is a list of some of the projects that I have been involved with. Click here for a more up-to-date information on research projects. Associate Editor: IET Computer Vision, 2012 -. Editorial Board: International Journal of Machine Learning and Computing, 2018 -. Editorial Board: MDPI Journal of Informatics, 2017 -. Executive Committee: British Machine Vision Association (BMVA), since 2012. Steering Committee: Medical Image Understanding and Analysis (MIUA), since 2011.
International Advisory Committee: CMBE2015 France. Organising Committee: CGA 2015 San Antonio USA, CMBE 2013 Hongkong, CMBE 2011 Washington, CMBE 2009 Swansea, PSM 2013 Cardiff. 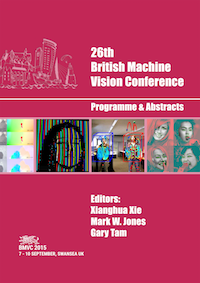 General Chair: 26th British Machine Vision Conference, 7-11 September 2015, Swansea UK. 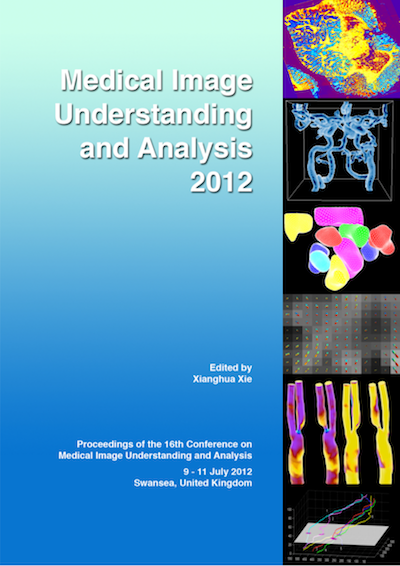 Chair: 16th Conference on Medical Image Understanding and Analysis, 9-11 July 2012, Swansea UK. Chair: BMVA Computer Vision Summer School 2014, 30 June - 4 July 2014, Swansea UK. Chair: EPSRC Network Meeting on Patient-Specific Meeting, half-day session on "Imaging, Segmentation and Meshing", April 2011. Chair: Shape Analysis and Deformable Modeling, ICPRAM Special Session 2012. Chair: Segmentation and Registration for Biomedical Applications, mini-symposium in CMBE 2013. Chair: Shape and Deformable Modelling in Biomedical Image Analysis, mini-symposium/special session in CMBE 2009 & CMBE2011. Co-chair: RIVIC Visual Computing Graduate School 2010. Co-chair: Methods of Image Processing and Analysis for Biomedical Applications, mini-symposium/special session in CMBE 2015. Co-chair: Segmentation of Anatomical Soft Tissue Regions in Medical Data, BMVA Technical Meeting 2008. Session Chair: MIUA2013, MIUA 2009, CMBE 2009 & CMBE 2011, SITIS 2007. Keynote: "Deformable Model in Segmentation and Tracking", AMDO 2012, July 2012. Conference Tutorial: SITIS December 2007. Major research councils, including EPSRC, BBSRC, MRC, NISCHR, Luxembourg National Research Fund, Canadian Research Council, and various charities such as Leverhulme. Internal Examiner: PhD - 2, MPhil - 1, Research Masters - 3. NISCHR Faculty Lead Researcher, since August 2013. Memeber of: IEEE (Senior Member since 2013, Member 2007 - 2012, Student Member 2003 - 2006), IEE (2006-2007), and BMVA (since 2002).